The following articles was written for ExplorersWeb by Steve House, Uphill Athlete co-founder. Uphill Athlete is a platform for openly sharing proven training knowledge for the sports of alpinism, mountaineering, rock and ice climbing, ski mountaineering, skimo racing, and mountain running. They offer free educational resources, sell well-designed training plans, and coach amateurs and experienced athletes to maximize their fitness and succeed in the mountain sports they love. Learn more about Uphill Athlete here. One question we often get at Uphill Athlete is: How fit do I need to be to climb/run/ski X? 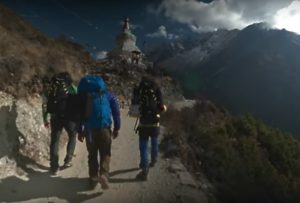 Since Himalayan season is here, in this article we’ll talk about big mountains and 8,000 meter peaks. 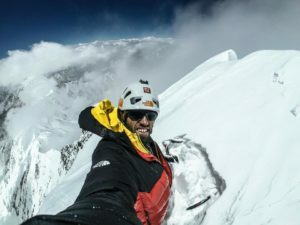 When I prepare for an 8,000-meter peak expedition I know my training is going to require a lot of three things: Duration, Consistency, and Elevation. Besides the training for my own expeditions, Uphill Athlete has now coached dozens of successful 8,000-meter peak climbers and we feel that we can confidently predict an athlete’s physical preparedness using these same metrics: Duration, Consistency, and Elevation. At Uphill Athlete, we use TrainingPeaks.com and find it to be essential in our training and coaching practice. 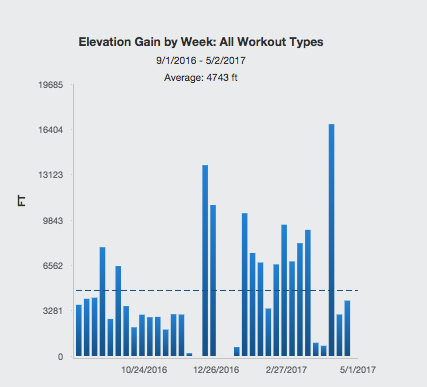 Training without monitoring can easily revert to random exercise (Full Disclosure: Uphill Athlete is a paying client of TrainingPeaks.com, we receive no kick-back or sponsorship of any kind). Their “Dashboard” feature, in conjunction with the assignment of Training Stress Scores (TSS) for each workout, is the basis of this and many other analyses we make of people’s training on a daily, weekly, and annual basis. If you’re not using it to measure and plan your training, we highly recommend it. Duration: By duration I mean weekly training time intelligently distributed by a good training plan or coach. 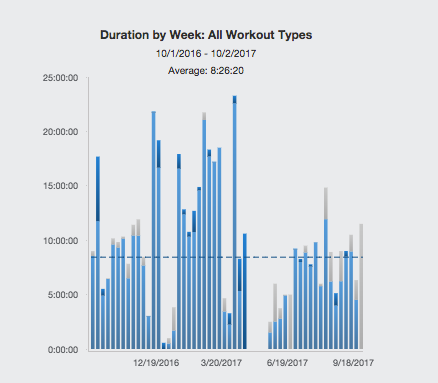 For the sake of this post, we’ll speak in terms of generalities, and below you can see a chart that calculates the average weekly training time for six months leading up to an Everest climb. This climber averaged 8.5 hours per week over six months. Note that there are a few weeks where nothing was recorded because she went to Aconcagua. Eight and half hours per week is only an average. It takes time to get to the fitness level whereby one can sustain a training load of 15+ hours per week. Not to mention the time needed for the logistics of driving to/from trailheads, eating, prepping, showering, etc. The only way to rack up this kind of training volume is with consistency. Weekly Training Volume for six months leading up to Everest. This climber’s six-month average was 8.5 hours per week. Consistency: Think of the blue line, which TrainingPeaks calls CTL, or Chronic Training Load, as fitness. We’re not machines, and this is not an exact science, so CTL isn’t perfect, but it is a very useful representation. So how fit do you need to be? In terms of CTL: Denali 75, Everest 100, Everest without supplemental oxygen, 125. To climb Denali you want to have a CTL of 75 for 2 months. For Everest at least 100 for 3 months. Everest without supplemental oxygen, we suggest a CTL of 125+ for 3 months. These are rough guides we’ve worked out over the last five years and they do seem to be pretty good indicators of physical preparedness. To get your CTL up that high, a couple things need to happen. It is well understood over a wide variety of sports that the maximum rate you can increase an athlete’s CTL safely is 3-5 points per week. So, to get to a CTL of 50 takes a minimum of 10 weeks. And that’s in a healthy, usually young, adult. To get to 100 you need 20-30 weeks in total. You can also work backwards. To get from 30 to 100, an increase of 70 CTL points, you need 15-23 weeks. AND THEN you need to hold that CTL there for a month or more. To get to a CTL score of 100 you need roughly five months to get there and then 1-4 months to hold the training load that high (while staying healthy) This requires consistency over time. In our example of the Everest-bound climber whose chart I posted above, a person with a long training history, her CTL broke 100 on 2/20/17, peaked at 137 on 3/28/17, and stayed above 100 until 5/1/17 when the climb began in earnest. This example illustrates the need for consistency and is why you need six to eight months to become fit enough to be prepped for an Everest with supplemental oxygen ascent. Of course, if you have more time, then so much the better. But do keep in mind that once your CTL is up around 100 you’re training 15-24 hours a week to keep it there, so this takes a big chunk of time. Elevation: At some point, to have you be mountain-ready, we have to have you going uphill for thousands of feet each week. Climbing requires different muscles than running flat/rolling terrain. The glutes, hamstrings; musculature around your pelvis, all are utilized in different ways when you’re going uphill. Whether you do this outdoors, in stairwells, or on a treadmill, vertical gain is crucial. Average vertical gain by month leading up to Everest. 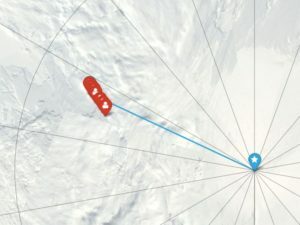 Despite the missing weeks in January due to a climb of Aconcagua, without correcting for that, her average weekly vertical was 4,700 feet over six months with weeks as high as 17,000 vertical feet. Start training early. Four months is an absolute minimum time required. Six months is nice to have and twelve months is ideal. Plan to ramp up from around 7 hours of training time a week to over 20 hours per week. Our athletes spend 2-3 hours per week strength training, which is counted in those totals but note that time spent strength training doesn’t increase over a long-term training plan. Plan to progress to the point where 5,000’/1,700m of climbing per week is easily sustainable and 15,000’/4,500m in a week is a reasonable maximum week. Uphill Athlete is a platform for openly sharing proven training knowledge for the sports of alpinism, mountaineering, rock and ice climbing, ski mountaineering, skimo racing, and mountain running. Uphill Athlete offer free educational resources, sells well-designed training plans, and coaches amateurs and experienced athletes to maximize their fitness and succeed in the mountain sports they love. Explore Uphill Athlete now.